When you are going hunting, hiking or backpacking and have limited space available, it is a good choice to bring a monocular instead of a more bulky pair of binoculars: the Vortex Solo Monocular is the perfect choice for your needs. The Vortex Solo 10×36 Monocular is lightweight, easy to carry, comes with a utility clip and a neck strap, and is compact but powerful enough to deliver amazing views of the nature around you. The Vortex Solo is also very reasonably priced for a very well built gadget. Below we’ll go into a detailed review of its features and compare it to its main competitors. We’ll start with breaking down some of finest features of this monocular to give you an idea of what you will be getting yourself if you go this route. The Vortex Solo is very sturdily built. It easily fits in your hand and is comfortable to hold due to its ergonomic design. The body has a rubber armor coating to prevent slipping, provide external protection and to absorb shock if accidentally dropped. The rubber coating has selected rigged parts for secure holding. The body is made of hard polycarbonate plastic to save on weight but still have enough sturdiness. The bulk of the weight comes from the glass lenses and its overall weight comes to 9.7 ounces. The monocular is fully waterproof and fog proof. There is an O – ring water seals that prevent water and dust from entering and interfering with the fine optics inside. The internal atmosphere is filled with nitrogen inert gas to prevent fogging when going from hot to cold areas and vice versa. 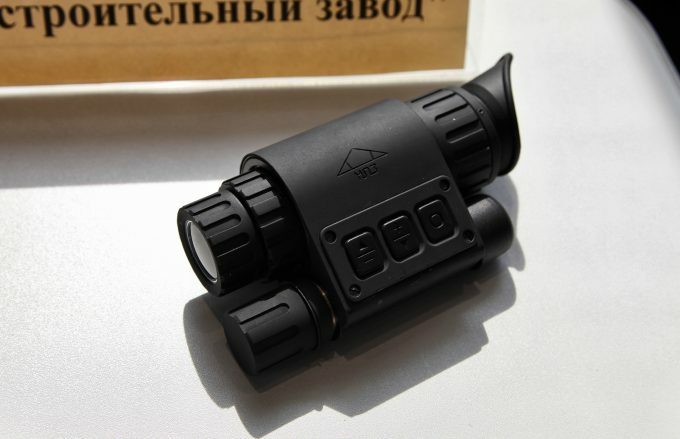 The magnification power is 10x, and the objective lens diameter is 36mm. This makes the exit pupil size 3.6mm, which is a good value for a gadget of this size. The prisms have roof design and are made from BaK – 4 prism glass – barium crown glass with high density and eliminated internal light diffusion. These prisms have superior quality over the cheaper BK – 7 prism glass. The Vortex Solo has fully multi – coated glass surfaces which deliver bright, crisp image. The relatively large 36mm objective lens allows for significantly more light to enter the monocular, giving it a brighter picture, even in low light conditions like dusk, dawn or with use in wooded or areas in the shade. The focus is achieved through a focusing ring with raised marks for easier turning. The focusing mechanism can be a little stiff at the beginning, but it gets loosened and easy to manipulate with prolonged use until the lubricating agent gets enough movement. The focusing ring however required two handed operations. The close focus of the monocular is 16.4 feet, which is a bit long and you will not be able to have very good close-ups of nearby objects. The Vortex Solo Monocular has a fast focus mechanism where the wheel is going from close to infinity in about a quarter turn. This alleviates the stress on the fingers after prolonged use and enables fast focus when you are not changing the distance often. The overall length of the Vortex Solo 10×36 is just 4.9 inches and at its maximal width is 2.6 inches. The hand grip width is only 2 inches, making it a very good fit in most hands. Its eye relief is 15mm, which is a reasonable size for most users. The eyecup is twist – up style, and it can be set in two positions – fully up and fully down. This is designed to accommodate both people with and without eyeglasses. The field of view is 325 feet over 1000 yards, and the angular field of view is 6.2 degrees. There is a small amount of distortion on the edges of the lens, but this is not going to be noticeable to the majority of users. The Vortex Solo monocular comes with a side utility clip for attaching it to your belt, pocket or backpack strap for easy access. The clip can be easily removed with the loosening of the two screws on top of it. The monocular comes with a suitable neck strap for easy carrying around your neck. It is good that both are available, but whichever choice for carrying you prefer is up to you. It also comes with a carrying case that fits snuggly over the monocular and protects it when carrying around. The case has a snap on belt loop for attaching it to your belt, but this may come loose, so it is smart to permanently stitch the snap loop so it will not open. The sides of the case are opened to enable possible dust and debris to escape the case and not scratch the lenses. However, if you plan to carry your Vortex Solo monocular in your backpack or luggage, you can always put it in a soft travel bag to protect it from possible damage. This monocular does not come lens protection caps. This is due to the fact that most people in the filed avoid using them or tend to lose them very quickly. However, if you really want those, you can purchase the Vortex Optics Flip Cap cover for about $10. 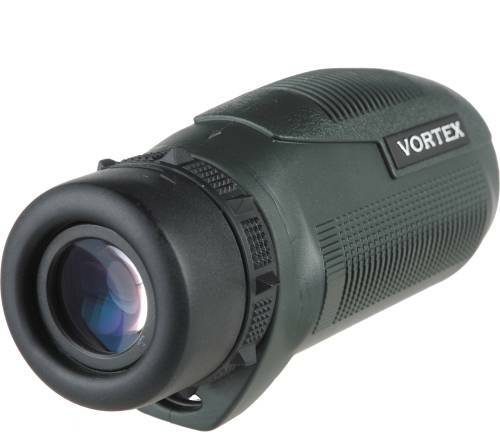 The Vortex Solo Monocular is a good choice for the outdoor enthusiast in need of good magnification without the added weight of a full size binocular. There are several interesting features that make the Vortex Solo 10×36 unique in its performance. 10x magnification power and 36mm objective lens: you get excellent magnification power, and the 36mm lens gathers more light when using it even in low light conditions. Waterproof, fog proof, shock proof: the monocular is sealed with O – ring seals to prevent water, dust, and debris from entering; the fog proof performance is enabled by internal nitrogen atmosphere; the rugged external rubber coating offers shock proof performance. Fully multi – coated lenses and superior prism glass: these features offer increased light transmission, decreased reflection and light scattering for getting crisp, bright images. Vortex VIP Unconditional Lifetime Warranty: unlimited, fully transferable, no receipt or warranty card required. The cost of a Vortex Solo 10×36 is around $110. This is fairly reasonable price considering its features and quality of built.The Vortex Company offers the VIP Unconditional Lifetime Warranty to its customers, and the Vortex Solo 10×36 is covered with it. The VIP stands for Very Important Promise that all Vortex products will be repaired or replaced in the event of damage. There is no fault clause stating that it does not matter whose fault it was, or where it was purchased, the damage will be repaired or the item will be replaced. The VIP is Unlimited Lifetime Warranty and is fully transferable without the need to have a warranty card or receipt. However, this warranty does not cover loss, theft, deliberate damage or cosmetic damage that does not interfere with the performance of the Solo Monocular. Now that you have seen everything that our main monocular has to offer, we’ll take a look at some different offerings to see if there is another monocular that could work well for your particular needs. The Vortex Optics Solo R/T is a good choice for people that enjoy hunting or a day at the shooting range. 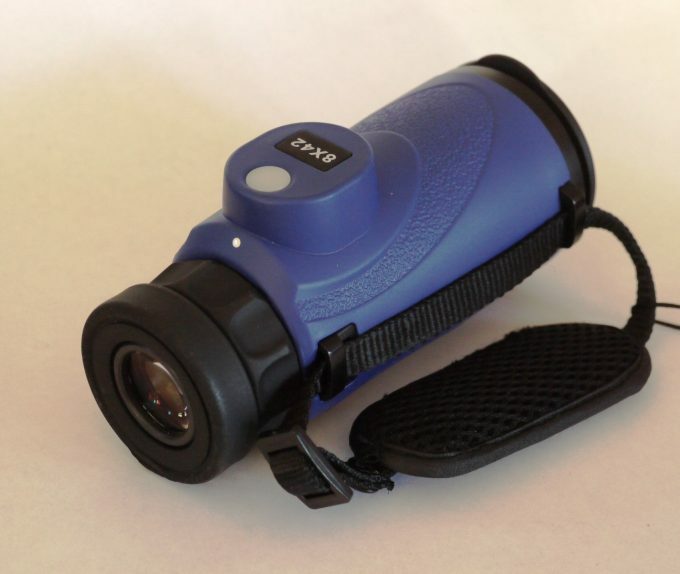 This monocular has 8x magnification power with 36mm objective lens. 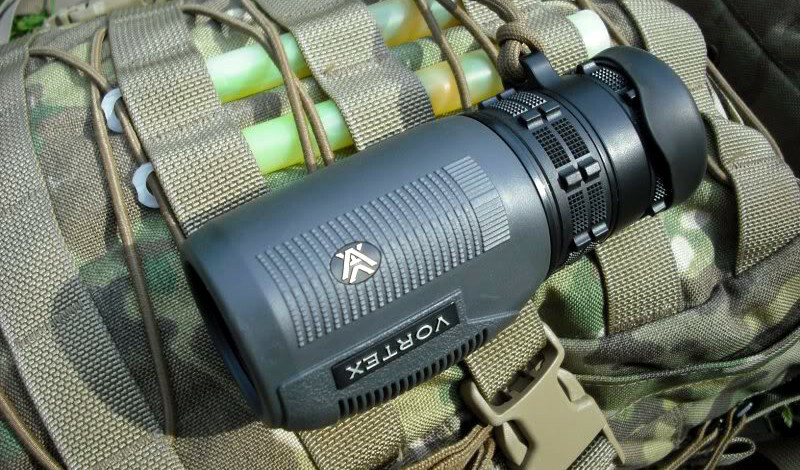 The body is lightweight with approximately the same dimensions as the Vortex Solo 10×36 monocular. 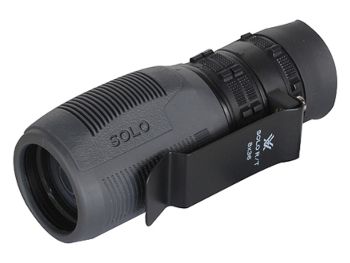 The Solo R/T Tactical Monocular has a roof prism design and features the Vortex R/T Ranging Reticule. The reticule has its own focus ring for accurate range estimation. The focus is achieved through a focus ring with raised bumps for easy focusing: same as the Solo 10×36 is also requires two handed operations; the eyecup is flared and adjustable; the eye relief is 18mm and the exit pupil size is 4.5mm. 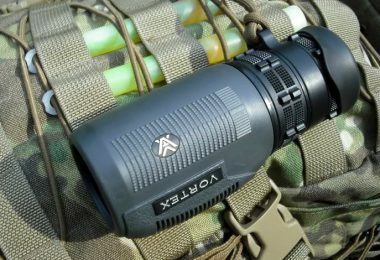 The other features are the same as the Solo 10×36: fully multi – coated optical elements for increased light transmission; 16.4 feet close focus; waterproof performance with O – ring seals, nitrogen internal atmosphere for fog proof performance; rubber armor for a nonslip grip and shock proof performance. There is also the utility clip for easy attaching to a belt, pocket edge or a backpack strap, and also no lens protection caps. This monocular also comes with a neck lanyard, carrying case and is covered by the VIP Unconditional Lifetime Warranty. 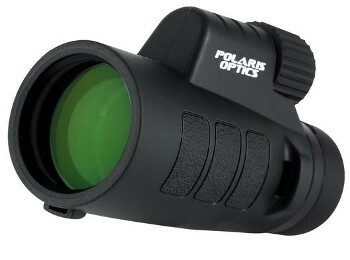 The Polaris Optics Tracker 8×42 has advanced optics, 8x magnification and 42mm objective lens. Compared with the Vortex Solo 10×36, this has lower magnification power, but a bigger objective lens for brighter images, and is cheaper than the Vortex. The focus is achieved by a top mounted focus wheel for single hand operation. The lenses are fully multi – coated for increased light transmission; the eye relief is 17.5mm, the eyecup is twist – up and twist – down adjustable to allow comfortable use for both people with and without glasses. The close focus is 6.5 feet, and you can easily observe nearby objects. The Polaris Tracker 8×42 monocular weighs 11.6 ounces, a little more than the Vortex Solo 10×36, and has approximately the same dimensions: 2.09×2.95×5.31 inches. This monocular is waterproof with O – ring seals that prevent water and debris from entering; is fog proof and the outside rubber armor makes it drop and shock proof. The Polaris Tracker 8×42 is tripod adjustable and comes with lens cover, carrying case, neck strap, cleaning cloth and 4 professional bird watching E-Books. There is also the 30 days money back guarantee and the Premium Lifetime Warranty. The Bushnell Legend Ultra HD 10×42 has 10x magnification power, the same as the Vortex Solo 10×36, but has a bigger objective lens with 42mm diameter. It is significantly more expensive than the Vortex Solo 10×36 monocular. The design of the prism is compact roof design, same as the Vortex Solo; the prism is made from BaK – 4 crown glass and is coated with PC-3 Phase Coating for decreased light scattering. 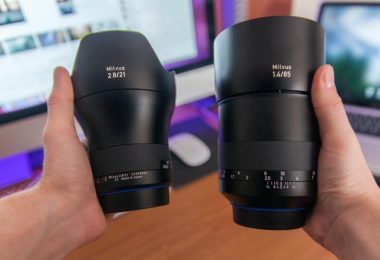 The lenses are fully multi – coated and are made from ED Prime Glass. It weighs 13.2 ounces and is 5.4 inches long. The exit pupil is 4.2mm, the eye relief is 15.2mm, and the eyecup is twist – up style for easy and fast adjusting. 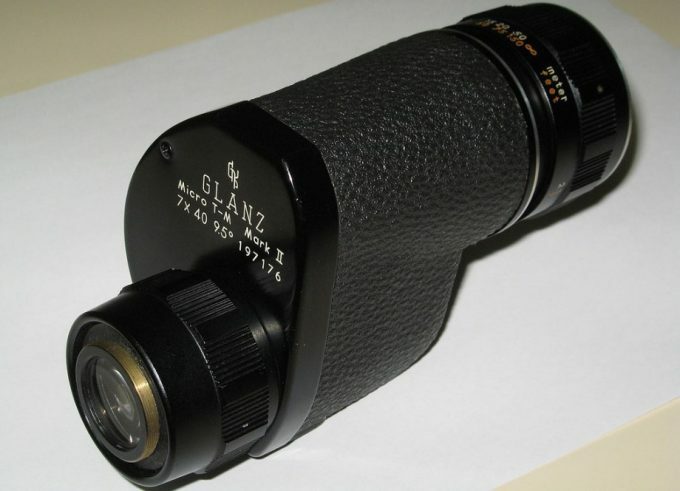 The close focus of this monocular is 6.2 feet, so you can observe very close objects. The focus is achieved by a top mounted focus knob for single hand operation. 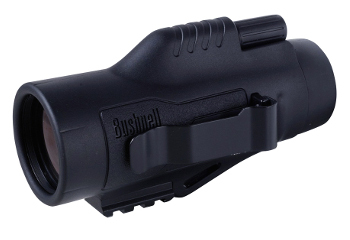 This monocular has waterproof and fog proof performance, and the lens has the Bushnell RainGuard HD coating for the fast and easy scattering of rain, snow, sleet, oil, and condensation. It also comes with a built in Picatinny rail mount, is tripod adjustable and is covered by Bushnell’s No Questions Asked Lifetime Warranty. The Vortex Solo 10×36 Monocular is a useful gadget to have at your disposal. It will give you the closer look you require, in a lightweight, ergonomic body that fits nicely in your hand. The hard polycarbonate plastic body offers enough protection for the high-quality prism inside. The fully multi – coated lenses increase light transmission for crisp, clear, bright images even in more low light conditions. The eye relief is 15mm and the twist – up eyecup provides comfort for both people with and without glasses. The exit pupil is 3.6mm, not as large as some other models, but given the other characteristics and reasonable pricing, this is a very quality item. 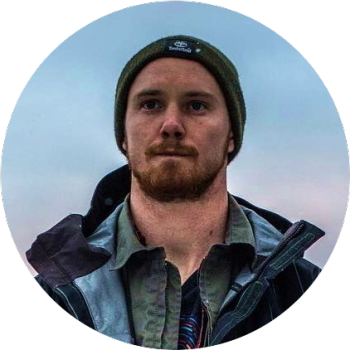 The focusing ring is easy to turn and the quick focus feature is excellent for hunters and hikers but may cause a bit of an issue with bird watchers or stadium sports watchers. The monocular is waterproof with O – ring seals that protect against moisture and dust; internal nitrogen atmosphere for fog proof performance and the rugged rubber armor provides no – slip grip and shock and drop resistance. It comes with a removable utility clip, carrying case, neck strap and is covered by the unlimited, no – fault, transferable, no receipt or warranty card Vortex VIP Unconditional Lifetime Warranty. 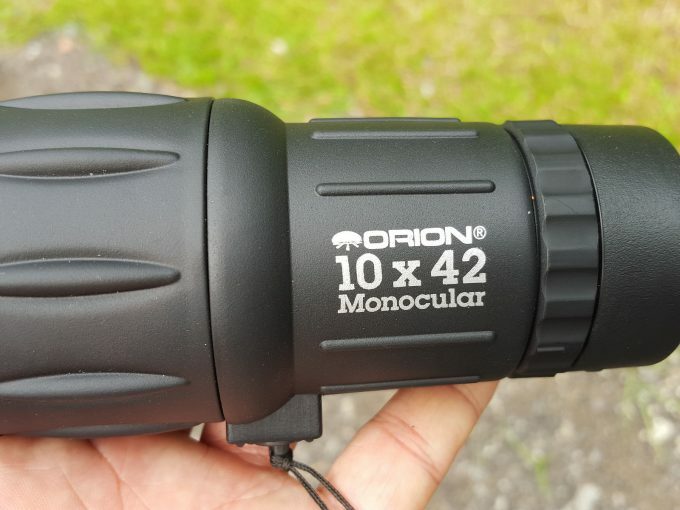 We have done an in – depth review of the Vortex Solo 10×36 monocular and we have also made a comparative analysis of its three main competitors; that way you can be fully familiar with all the possible options when considering getting a decent monocular. From all the things stated in the text, we can easily recommend the Vortex Solo 10×36 monocular as a suitable choice when looking in the around $100 price range. 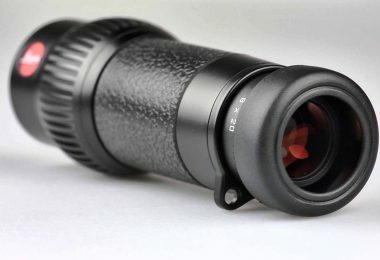 The Vortex Solo 10×36 monocular offers great views in a lightweight, ergonomic body. It has fine optics, fully multi – coated lenses and delivers crisp, clear images at a very reasonable price. Already own a monocular? Tell us your thoughts and experiences in the comments below.